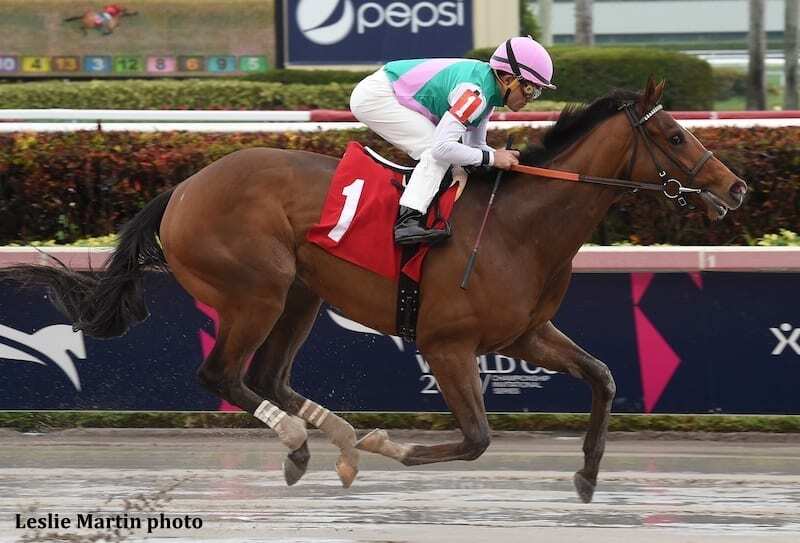 Juddmonte Farms' homebred Hidden Scroll, an impressive winner of his lone career start Jan. 26, drew Post 7 and was installed as the 9-5 program favorite for Saturday's $400,000 Xpressbet.com Fountain of Youth (G2) at Gulfstream Park in Hallandale Beach, Fla. The 73rd running of the 1 1/16-mile Fountain of Youth for 3-year-olds, the final step on the road to the $1 million Xpressbet.com Florida Derby (G1) March 30, attracted a field of 11 sophomores. It is carded 13th on a blockbuster 14-race program featuring nine graded-stakes worth $1.65 million in purses. First race post time Saturday is 11:30 a.m. ET. Post time for the Fountain of Youth is set for 5:32 p.m.
Hidden Scroll, a Hard Spun colt trained by Hall of Famer Bill Mott, made his career debut on the undercard of the $16-million Pegasus World Cup Invitational Championship Invitational at Gulfstream, going gate to wire to win the one-mile maiden special weight by 14 lengths in 1:34.82 over a sloppy, sealed track. To be ridden by Joel Rosario, Hidden Scroll will carry 116 pounds, six fewer than co-topweights Vekoma and Signalman. R. A. Hill Stable and Gatsas Stables' Vekoma, undefeated in two starts including the Nashua (G3) last out, is second choice on the morning line at 7-2. Kentucky Jockey Club (G2) winner Signalman is third choice at 9-2. This entry was posted in Triple Crown and tagged bill mott, fountain of youth stakes, gulfstream park, hard spun, hidden scroll, joel rosario, Juddmonte Farms, vekoma by Press Release. Bookmark the permalink.